This to say, there is a lot of stuff in our bedroom. Besides figuring out a workable floorplan, the other big challenge was to come up with a color scheme that made the burgundy carpet seem intentional. For a while my plan was to use cream, white, yellow, and brown for a neutral look with perhaps a touch of green for color, but I was not entirely happy about ignoring the carpet color in that plan. It’s not what professionals do. One day I had a brainstorm. One of my favorite shirts is a striped tee in… burgundy and orange! I decided to make those my accent colors for the room. 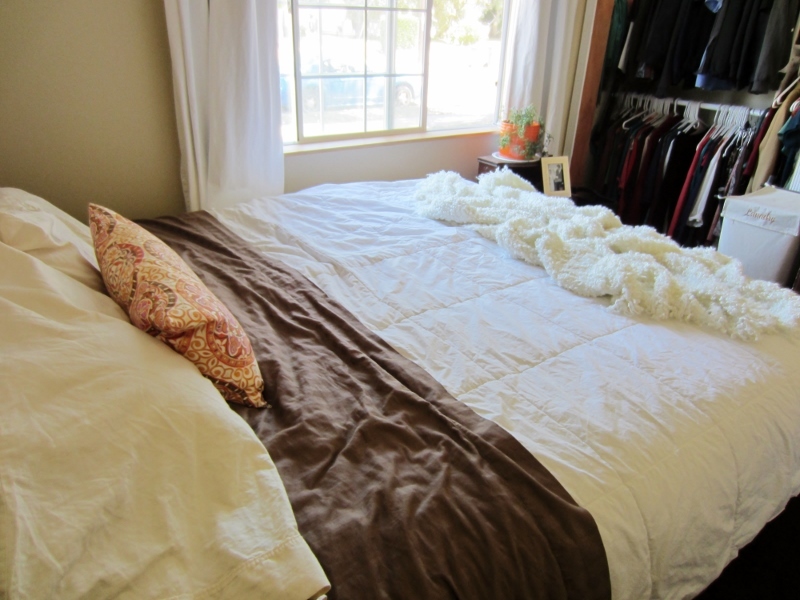 I could pull in the carpet color and still have the serenity of warm neutrals – something like this. The room still has plenty of tweaking to be done, but here are some in-progress shots. This is the crib corner. Although you can’t see it super well, I got the idea for a crib skirt from View Along The Way but I was even lazier more creative than Kelly. Instead of sewing three panels and thumbtacking them to the crib’s mattress base at the correct height, I used a shawl I already owned and upholstery-stapled it to the mattress platform. 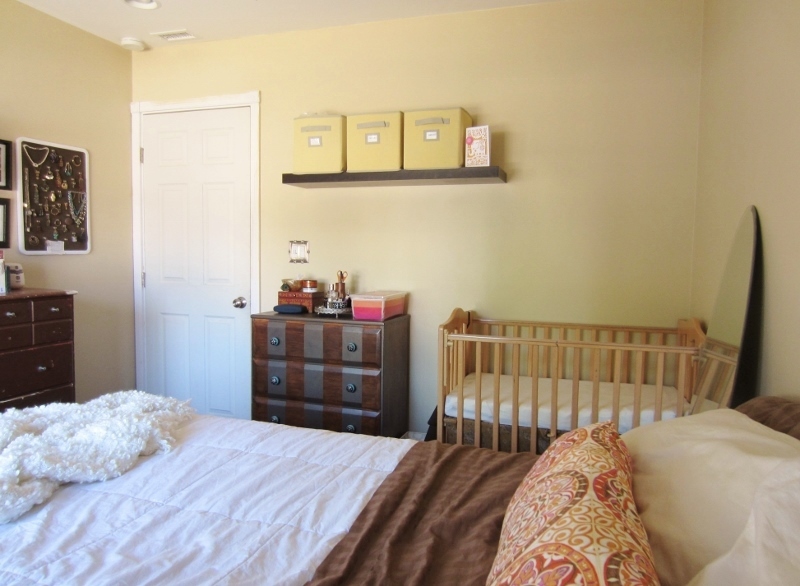 The three bins on the wall shelf hold cloth diapering stuff, onesies, and other clothes. 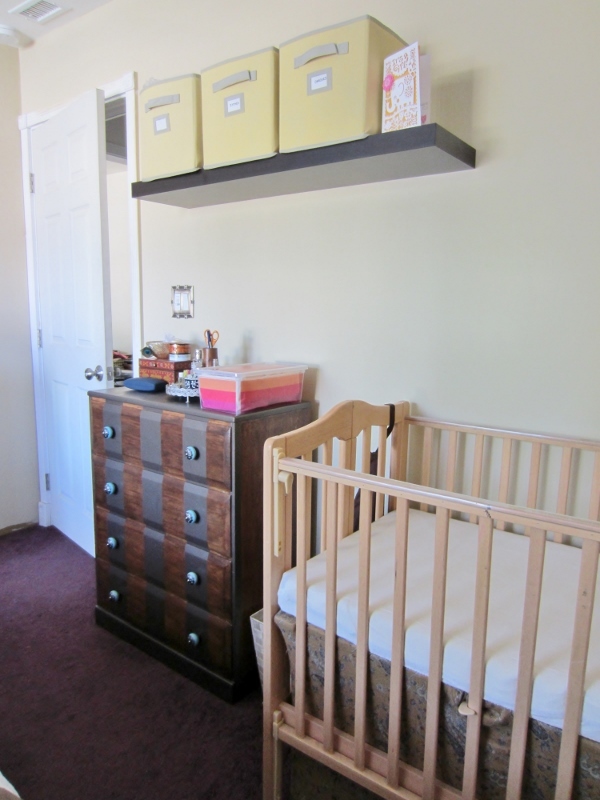 The awesome pink-to-orange ombre box is from Target and has random small baby items in it. I just couldn’t turn the whole top of my dresser into a changing table. I need someplace for my perfumes and pretty boxes, you know? Changing shall happen on the nearest flat surface. To the left of that spot is the big dresser with the Chief’s clothes. He’s had this dresser since childhood if I recall, and it’s been repainted a lot and acquired handles made out of bolts at some point. Maybe some day we’ll find a nice antique to replace it but for now, hey, at least it’s brown and that works for me. 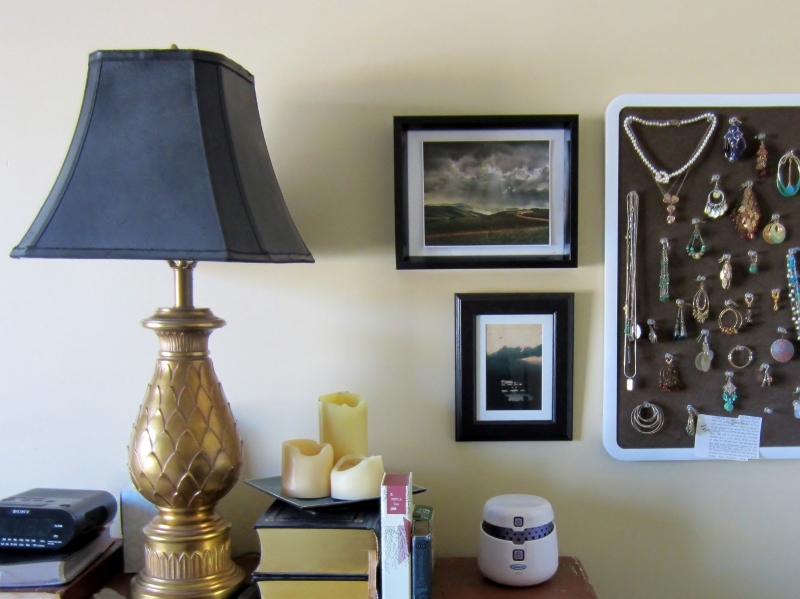 I put my brass and black lamp on it and made a nice wall collage of two moody prints (free art from books) and my corkboard jewelry organizer. I’ve kept my jewelry like this for years and I love it – I mostly wear earrings and it’s really ideal. It’s just a bunch of clear pushpins in an off the shelf corkboard. Also, please note the white noise machine below the art. Keeping it real! I think this thing will be a lifesaver for sharing a room with Baby S.
Under the long side of the bed I have three large bins that are easy to access: one for my most frequently worn shoes, and two for baby clothes in bigger sizes and baby blankets/bibs/whatnot. The Chief keeps his shoes lined up in a row under the end of the bed. Here’s our bed with the closet, nightstand, and laundry baskets beyond. You can see the pillow on the bed and the flowerpot with ivy are bringing in some more of that orange accent color. The pillow has burgundy in it as well – you can see it better in the next photos. 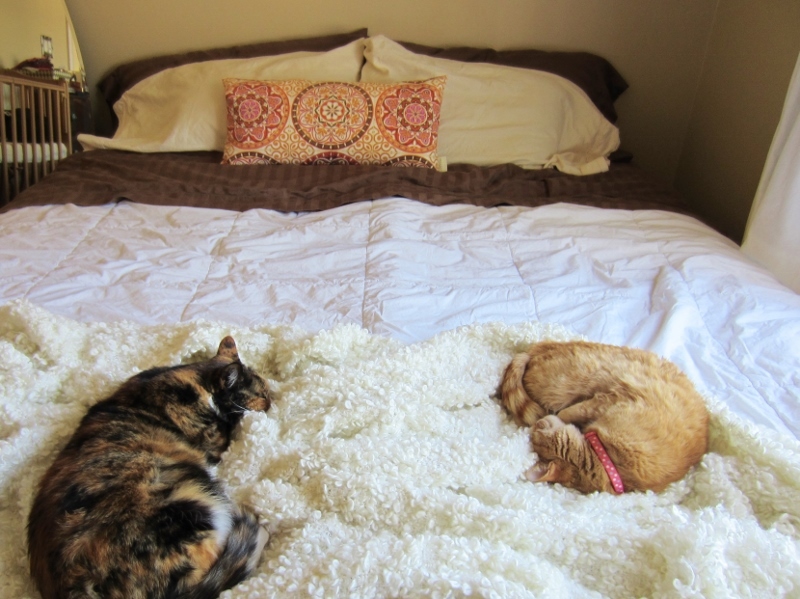 The throw at the end of the bed is the highly textured Ofelia throw from Ikea. Texture is important to me for this room and I’m trying to include as much as possible to add interest to a mostly neutral color scheme and to create that nest-y, cozy, inviting feel in this low-sunlight bedroom. 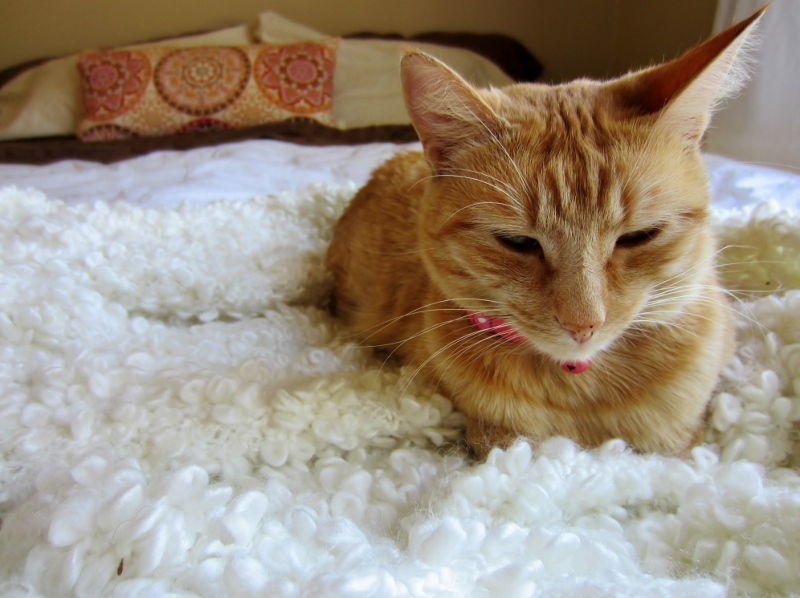 The cat loves that textured throw. In fact all the cats do. Here’s a shot from a little farther back to give you the context for everything. My next plans for the bedroom are to keep bringing in color and texture. I’ve got a great orange and burgundy polka dot print that I’ll make a mobile out of and hang over the crib. I have a piece of cream-and-gold cloth to make an upholstered headboard, probably tufted, and I’d like to add some wall sconces around the bed. Here’s a quick mockup. 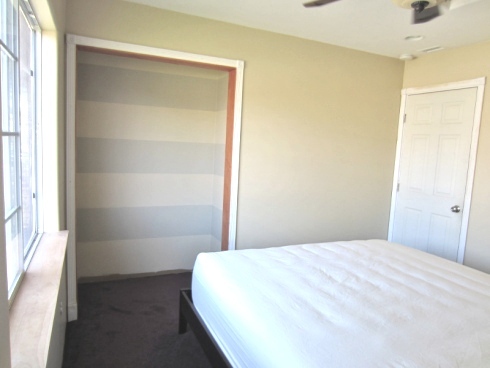 The closet may get curtains hung over it at some point, and there definitely needs to be some more wall art. The plain white curtains will get some colored ribbon trim. I’m sure I’ll think of other tweaks as I move forward! I’m so happy with the foundations of our bedroom. It is a great relief to have an idea about colors that I can move forward with, and I’m looking forward to lots of fun bringing in the details. How do you like the progress so far? I love what you’ve done so far. The orange and burgundy accents are so smart! And high fives for an even lazier crib skirt – I love it! Haha. Also, I totally need that brass lamp of yours. It is so stunning! I ‘specially love it that yr cats match! You know what? You actually managed to make a burgundy carpet look GOOD! The room is looking really great so far and I love your plans for the headboard and sconces.